Sony Pictures Classics, 119 mins. R (for child violence). How many religious and humanitarian traditions have versions of the injunction to “turn the other cheek” when confronted with violence? How easy is it to do? And how much harder is this for children to understand? These are questions that Susanne Bier poses in an intriguing little film that scarcely made a dent in English-speaking lands (perhaps because only New Zealand and Canada make lists of least-violent nations), despite winning the Best Foreign Language Oscar in 2011 and some Golden Globes prizes as well. Bier not only asks these questions, she ruffles some feathers while doing so. She’s Danish and, according to most measures, Denmark is the 2nd least violent nation on earth (after Iceland) and its people are the world’s happiest. By setting Haeven in Denmark, Bier signals that not everyone is content in the land of Hans Christian Anderson, and that includes the children for whom Anderson fashioned fairy tales. Bier also blows the lid off of Denmark’s reputation for tolerance by centering the violence on unaccepted outliers. 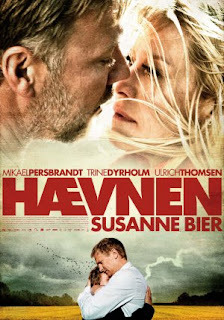 The film opens in Africa, where Anton (Mikael Persbrandt) is on a Doctors Without Borders mission. He’s Swedish, but he now lives in Denmark, near his estranged wife Marianne (Trine Dyrholm) who has custody of their son Elias (Markus Rygaard). Elias is the target of bullies at his school, an object of scorn for his accented Danish and Swedish features. School is a nightmare for the passive Elias, until another new kid, Christian (William Tøhnk Nielsen), shows up. He’s rejected also, both for his time abroad and for fear he might be psycho. But when he puts the fear of sudden demise into Elias’s main attacker, he and Elias become best friends even though Christian is everything he’s been warned to avoid. Christian is indeed a mini mite of rage. He and his widower father, Claus (Ulrich Thomsen), have just returned to Denmark from London, where Christian’s mother died of cancer. The pre-teen Christian cannot come to grips with the unfairness of her death and he’s sullenly taking out of his anger on whomever gets in his way. He’s also very attracted to fantasy, the ledge of a towering grain elevator, and Internet bomb-making sites. Add to this a hard-to-take lesson in cheek turning from Anton when he is confronted by a loutish auto mechanic, and the potential for pyrotechnics is high. Are we priming for a Danish version of Columbine, or will peace reign in the end? Watch this gripping little drama and find out. All I will say is that the plot is further seasoned with an interesting twist involving an African warlord. Haeven–available on Netflix–falls into a category of films aptly labeled “hidden gems.” It’s no masterpiece, but it’s taut, tense, and provocative. It’s also very well acted. Both Persbrandt and Thomsen are well known in Europe, hence they’ve garnered praise there, but the hands-down stars are the two boys, Rygaard and Nielsen, who remain steadfast in their 12-year-old logic systems and never sully their performances with mawkish cuteness. This one is well worth a rental, but be prepared for some eye-shielding tension. Big ideas. big performances, and downsized script. When rumors surfaced that Steven Spielberg intended to direct a biopic of Abraham Lincoln, historians worried that he would turn the 16th president into Indiana Jones, while action movie fans fretted he was going to make another didactic film in the spirit of Amistad (1997), Saving Private Ryan (1998), or Munich (2005). Lincoln will throw some raw meat to be both howling packs, though it won’t slake the appetite of either. The first thing you need to know about Lincoln is that it’s neither a masterpiece nor a bomb; it’s a most uncharacteristic Spielberg film–a middle-of-the-road effort that, were it not for several sensational performances, would probably be forgotten very quickly. Spielberg and scriptwriter Tony Kushner wisely opted to forego a Lincoln biography and concentrate on the five-month period between November of 1864 (Lincoln’s reelection) and April of 1865 (his assassination). They truncated the story even further by concentrating of the battle to pass the 13th Amendment to the U.S. Constitution, which officially banned slavery. Kushner’s script was based on Doris Kearns Goodwin’s Lincoln biography, Team of Rivals, an intriguing but flawed book from one whose scholarship is not always as careful as it should be. But Goodwin isn’t the problem here; Kushner is. He provides a script that’s long on quips and zingers, but devoid of pacing. The first half of this two-and-a-half hour film feels epic, and not in a good way. Virtually every character in the Congressional debate is introduced, even though most end up making little more than cameo appearances. One might applaud an attempt at thoroughness, or one might conclude that this level of detail is the job of biographers and that there are just too many players to keep straight unless you are a history junkie. (I am a historian, but I come down on the “too many” side.) Nor can we dimsiss Kushner’s plodding pace as being true to the historic record; prior to the publication of the Congressional Record after 1873, there was no verbatim account of Congressional debate, just notes. (And even today members can “edit” their remarks prior to publication.) This means that nearly every scrap of dialogue in Lincoln is imagined rather than literal. This includes Lincoln’s own words and thoughts; he was a deeply private man who did not keep a diary and from whom precious few private letters exist. Most of what we think we know of the man comes from secondhand accounts from friends and foes. At the end of this review I will append some scholarly observations but first, back to the film. 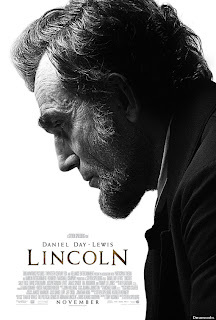 Everyone is talking about the performance of Daniel Day-Lewis as Lincoln, and well they should. I can’t imagine that Day-Lewis won’t win the Best Actor award for this performance. He looks the part­–right down to unkempt hair, the unwashed clothing, and the haggard ashen face of a leader whose vitality, like the flower of male youth, was drained by four long years of bloody warfare. Even the voice is right; Lincoln had a high squeaky voice, not the sonorous tones we hear in plays and heroic film bios. Day-Lewis also humanizes Lincoln to the degree that Spielberg allows him to. Like the president he plays, Day-Lewis is in command. Just wrap the Oscar now and spare us the long ceremony. While we’re at it, reserve one for Tommy Lee Jones as Thaddeus Stevens, the leader of the Radical Republicans and one of the few white men in North America who believed in African-American equality. Jones is a volcano whose explosion is being (barely) contained by a pot lid, the hope that the 13th Amendment is the first step in racial justice. Shout-outs also for James Spader as Republican Party “fixer” William Bilbo, and for Jackie Earle Haley’s wily-meets-oily portrayal of Confederate Vice President Alexander Stephens, the head of a delegation hoping for a last-minute ceasefire and appeasement that might preserve slavery in the South. As always, David Strathairn is emotive and strong, this time as William Seward, Lincoln’s Secretary of State. Other good things include the crisper pace of the second half of the film, one which actually made Congress’s deliberative ways seem exciting; the film’s humor; and the story it tells. If you thought the Emancipation Proclamation freed slaves, you are the victim of a very old myth. (See below) As the film shows, it took the 13th Amendment to end slavery, and it was vital that it be done before the war actually concluded. Kudos to Spielberg for deciding to cut to the chase of what the Civil War was really about. The weaknesses? The film is too long, Kushner’s script stripped of its witticisms is pretty ordinary, and there’s still a bit too much deification of Lincoln–aides looking up with doe-eyes, diaphanous lighting that presages angelic transformation, and brass fanfare from John Williams. The soundtrack is cloying, as if Williams was trying to outdo Aaron Copeland’s A Lincoln Portrait in solemnity or Fanfare for the Common Man in anthem-like majesty. This is especially noticeable in the film’s telescoped coda that takes us from the amendment’s passage in December of 1864, to Lincoln’s murder less than four months later. Spielberg is also ham-handed in this section as he covers events in lightening speed that could have dispatched more cleanly by either a voiceover or a rolling text scroll. Parts of the film also feel too modern, as if Spielberg was trying to slip in some of those Hollywood liberal values that the political right so despises. I was happy that Spielberg presented slavery as an intractable problem that only government could arbitrate, but I also half expected an impromptu soliloquy on the virtues of strong central government. · Buying Congress: People love to say that today’s politicians are crooked, and so they might be. But they are pikers compared to those of the 19th century. Congress was so corrupt that money was handed out openly and most principles could be compromised if the price was right. All manner of political bribes were used to get the 13th Amendment through the Senate. It didn’t unfold exactly as shown, but deals were made. · The Overrated Emancipation Proclamation: In the film, Lincoln called it a “war measure.” That’s right (it also had the purpose of helping dissuade the British Parliament from giving aid to the Confederacy, as it would appear that Britain was supporting a practice-slavery-it had outlawed). The Emancipation Proclamation was of dubious legality and it freed almost no slaves as it was confined to “those areas under rebellion,” not those under federal control or those that has surrendered. It is one of history’s great symbolic documents, but it did not free slaves. · Victory was still in doubt: No, the Civil War wasn’t just a mop up after the Battle of Gettysburg. The biggest threat to the Union was always political, not military; it was never a question of which power was stronger, but whether the Union had the political resolve and public support to win the war. The Southern strategy was to wage a war of attrition and many Northerners had had enough by 1864. Lincoln faced strong pressure to negotiate an end as late as the opening months of 1865. · Not all the Democrats were in the South: Lincoln feared he might lose the election of 1864 and that was not paranoia. The Democratic Party remained strong in the North, especially in the Mid-Atlantic States. Many Democrats­­–including the execrable Fernando Wood of New York–were “Copperheads” who sympathized with the Confederacy. · The Republicans were a nest of vipers: Southerners stereotyped the Republicans as a party of fanatical abolitionists and social levelers, but that was not the case. Only the party’s extreme left wing (typified by Stevens) believed in equality. Not even Lincoln was an abolitionist until 1864; he supported gradual emancipation prior to then. More to the point, the GOP was so faction-ridden that it would have won the presidency in 1856 if the party had united behind one candidate. Lincoln was that one candidate in 1860, solely because he was the least objectionable to the factions. Lincoln was surrounded by men who felt they, not he, should rightfully be president, and some were openly disrespectful. · The cracker-barrel president: Lincoln, by most accounts, loved stories and jokes, but Spielberg/Kushner give us a president who, whenever things were toughest, trotted out shaggy dog tales filled with uncommon wisdom that cut through the crap. The president does stand-up? No. · Mary Lincoln was no Sally Field: “Lovable” is not a word used by many to describe Mary Todd Lincoln. She was known for being vain, cantankerous, and quite probably bipolar. Some of her critics even accused her of being a Confederate spy! Granted losing one’s child and (later) her husband could drive one to despair, but the film’s suggestion that Mary had a temporary nervous breakdown is probably too optimistic; she might have been nuttier than a Snickers bar well before Abe was felled. · Thaddeus Stevens and his ‘black’ mistress: This was a story told by his enemies to slander Stevens, but it’s more complicated. Lydia Hamilton Smith, his housekeeper and lover, would indeed have been viewed as “black” by the standards of the day, but she was a quadroon who, by outward appearances, looked white, not like S. Epatha Merkeson, the African-American actress who played her in the film. Which came first, Stevens' belief in equality or the affair? Unclear. · Congressional capers: The caper-like pacing of recruiting supporters for the 13th Amendment is surely cinematic invention modeled on Keystone Kops hijinks. · Lincoln wasn’t Lincoln yet: Did two soldiers, one white and one black, recite the Gettysburg Address to the president from memory? Call it a Hollywood moment! Like John Kennedy, Lincoln was more beloved in death than in life. · Congress isn’t a courtroom: But Kushner and Spielberg played it like one for the final vote on the 13th Amendment. Roll call voting was done alphabetically, not by state. This scene is pure TV courtroom in its staged drama. · Word up: A final reminder that most of the dialogue, except when documents are being quoted, is imaginary. Don’t quote this film and think you’ve quoted Lincoln lest first you verify. Especially if you’re in my class! If Ken Burns were an undergraduate student, his professors would take him to task for padding his work. Last week’s Dust Bowl would have made a superb one-hour show; alas, at four hours it’s redundant and tedious. Even more unforgiveable for what Burns rightly called “the greatest man-made environmental disaster” in U.S. history, it ultimately bores its viewers. And this isn’t my assessment, rather that of the students in a university course I teach titled “From Roosevelt to Reagan,” who have studied the Dust Bowl and were primed to view it. Just two of twenty managed to get through all of it, which put those two one up on me; I feel asleep for about 15 minutes the first night. Burns is a nonpareil researcher and, once again, has unearthed several personal narratives that had the potential to humanize the tragedy. For a ten-year period between 1929 and 1938, every state in the union except Vermont and Maine experienced periodic drought conditions. Higher-than-normal temperatures, winds ripping across prairies that should have sported grass rather than plowed fields, unscientific farming, and no water made for storms analogous to Hurricane Sandy, except that they were made of dirt, not rain. Soils blown from Montana routinely blocked out the noonday sun in Chicago, Buffalo, Boston, and Washington days later. Burns focuses his attention on the Panhandle region of Oklahoma, where it intersects with Texas, Colorado, Kansas, and New Mexico. Through diaries, interviews, and newspaper accounts he further refined his study to a handful of families that he uses as avatars to propel us through the “Dirty Thirties.” Not a bad idea. Nor is there any faulting his historical data. Burns’ problems are threefold. First, he’s been recycling the same filmmaking techniques for decades, so there’s very little we don’t see coming from across the metaphorical prairie. Second, he steadfastly refuses to work with editors that would pare his work. Third, he knows how to research, but not how to draw conclusions. 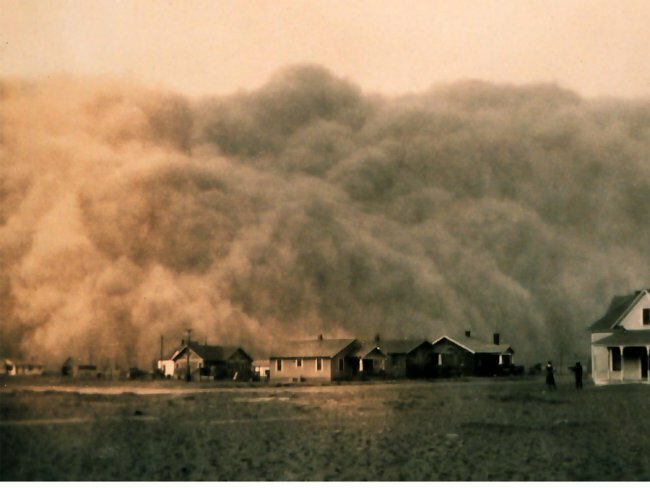 If you’ve seen anything Burns has done since his Civil War series, you know how The Dust Bowl looks. iMovies has a special application in which a still is displayed in tight and then the camera pulls back; it’s called “The Ken Burns Effect.” Add some talking heads (Dust Bowl survivors, grandchildren of survivors, and some academics), and an omniscient narrator—Peter Coyote in this case–and you pretty much have the film’s structure, look, and modus operandi. There is some archival film footage, but it’s not in the best of shape, hence the screen in static for most of the time. And for God’s sake, if Burns uses Stephen Foster’s “Hard Times Come Again No More” as the soundtrack for one more film, I will dig up Foster, reanimate him, and underwrite his lawsuit to recover royalties from Burns! The repetitious filmmaking methods wouldn’t be nearly so noticeable if Burns didn’t repeat everything else. The film feels like it was made by a hoarder afraid to let go of anything. Here’s what the film tells us: the Dust Bowl was preventable and man-made; it was bad; people struggled to survive and some didn’t; it was really bad; children’s health was adversely impacted more than that of adults; it was really, really, really bad; the government tried to help, but met with limited success; things were just awful; the Dust Bowl transformed the region; oh-my-God it was terrible. Burns is so enamored of his human sources that he allows them to say the same thing over and over again. I admired the attempt to personalize the tragedy, but once we get the scope of it, what more is there to say, really? Is there any point to comparative catastrophes? The inability to think like a scholar is what ultimately trips Burns. First, by choosing the hardest-hit region of the country, he gives us a view of the Dust Bowl that is both skewed and myopic. It looked quite different, for example, in the Cotton Belt, where many of those blown out were black sharecroppers. (Burns doesn’t have a clue on how to do Black history; nearly all of his work is lily white.) Burns is certainly right that the Dust Bowl was very, very, very bad, but it didn’t last ten years in most of the nation. Second—as several students pointed out to me—Burns truncated government actions. We hear informants tell us about how President Roosevelt tried to help but, oddly for such a long film, he crunches all of New Deal into a recited litany that occupies just a few minutes and does so in a manner that elides programs that occurred in 1933 with those that take place five years later. He also gives the same weight to programs that delivered direct aid with spectacular failures deemed overly radical (like resettlement villages and attempts at collective farming). What we don’t get from this is why farmers continued to idolize FDR even though nothing seemed to work.